Vancouver is probably the most beautiful city in Canada and one of the most attractive in the world. It also aims to become the “greenest” city on earth. 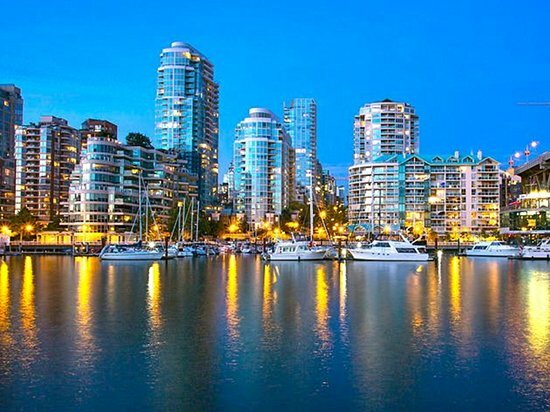 Located on Canada’s Pacific coast, Vancouver is marked by ocean on one side and mountains on the other, and blessed with a moderate climate that provides gorgeous vegetation year-round. 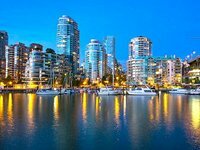 The third largest city in Canada, with a population of about 2.5 million, and the country’s largest port, Vancouver also offers a wealth of things to do and see for visitors. If not before, it was made famous in holding the 2010 Olympic and Paralympic Winter Games. While Vancouver’s appeal is enough to enthrall visitors for days, it is hard to resist several out-of-town attractions, too. 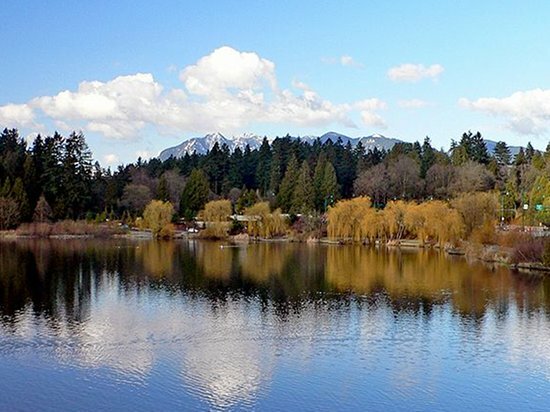 At 1000 acres, Stanley Park is one of the largest urban parks in North America. It features all aspects of coastal vegetation, including gigantic rain-forest trees, a Rose Garden, Totem Poles, beaches, and magnificent views of the Vancouver harbour, the city skyline, and Lions Gate Bridge. One of the most popular ways to experience the Park in its entirety is to take a one-hour old-fashioned horse-drawn carriage ride. The Vancouver Aquarium is also one of the largest on the continent, and displays virtually every species of marine animal, including penguins, dolphins, sea lions, jelly fish, and beluga whales. where? Stanley Park juts out into English Bay from downtown Vancouver. Walk or bike from the intersection of Georgia and Denman streets; cars approach the Park from Georgia Street and will find parking; and the Park can also be assessed by public transit—catch the #19 Stanley Park bus from Pender Street at Granville. The Aquarium is in the heart of the Park. visitorexperience@vanaqua.org. when? Stanley Park is always open. The Vancouver Aquarium is open every day from 9:30 a.m. to 5:00 p.m. (and 7:00 p.m. in July and August). The horse-drawn carriages operate daily from 9:40 a.m. to late afternoon. £$€¥ Entry to the park is free. Vancouver Aquarium: Adults: $25.00; Seniors, Students, and Youth: $18.00; Children $14.00. (Add $5.00 to each category during the summer months). Horse-drawn carriage ride: Adults: $29.99; Seniors and Students: $27.99; Children: $15.99. Granville Island is actually a peninsula sticking out into False Creek which is teaming with residents and tourists alike who are primarily drawn by the large public market, featuring the produce of farmers and the work of local artists. For children, there is a Kids Market, Adventure Zone, and Water Park, while for all ages the Island provides buskers, musical shows, theatre, festivals, and art galleries and exhibits. There is a wide array of food available, from casual to gourmet, and the Granville Island Brewing Co. provides beer-tasting and tours. Granville Island also contains the Emily Carr University of Art and Design. Gastown is a 12-block area close to the waterfront in which heritage buildings and warehouses have been transformed into trendy shops, restaurants, clubs, and galleries. It is the home of the city’s foremost artists and designers, and includes some of the country’s leading Aboriginal art. where? Granville Island is across and under Granville Street Bridge from downtown Vancouver. It can be accessed by foot, boat (the Aquabus and False Creek Ferries), and bike; public transit is available by taking Bus #50 from Granville Street. While also accessible by car, parking is limited, and preference is given to pedestrians. Gastown includes Water and Cordova Streets and Trounce Alley between Richards and Columbia Streets. It begins close to the Waterfront Sky Train station. when? 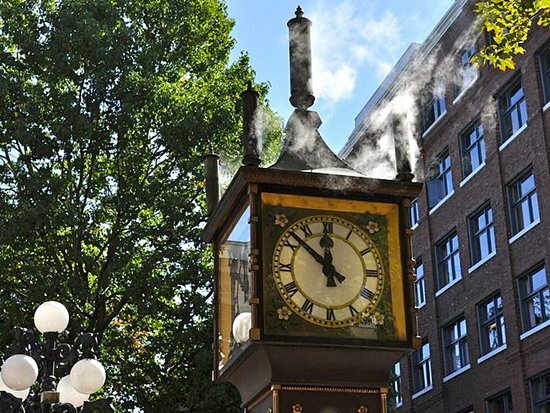 Both Granville Island and Gastown are open at all times. The Public Market on Granville Island is open 7 days a week from 9:00 a.m. to 7:00 p.m.
£$€¥ Wandering around Granville Island and Gastown is free. 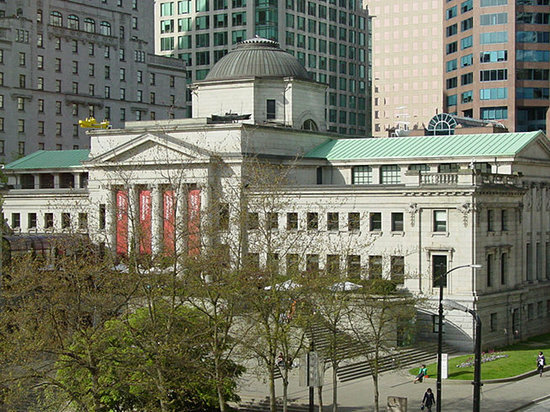 The Vancouver Art Gallery is one of Canada’s most important, with over 10,000 works, specializing in art of Vancouver and British Columbia, with the largest collection of paintings by Emily Carr. It also offers exciting exhibitions and contains a gift shop and café. The Vancouver Public Library is a striking piece of modern architecture based on the Roman Coliseum. It is worth looking at even from the exterior, although it is also interesting inside, including a lively pedestrian concourse. 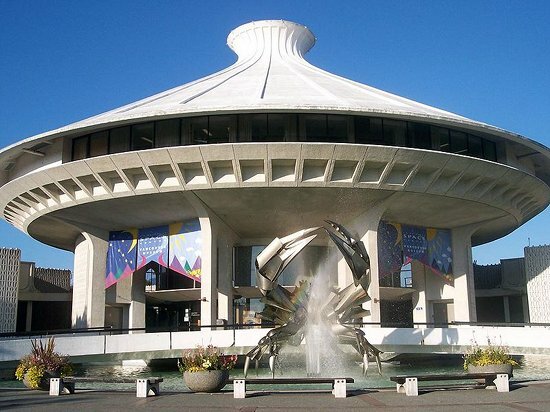 The Museum of Vancouver concentrates on artifacts from the history of the city and is located in a cluster of attractions including the Maritime Museum and the Space Centre. where? The Vancouver Art Gallery is in the heart of downtown, an impressive building bounded by Hornby, Robson, Georgia, and Howe Streets. The Vancouver Public Library is a few blocks east of the Art Gallery on Georgia and Homer Streets. The Museum of Vancouver is just across the Burrard Street Bridge from downtown, on Chestnut Street. It is served by buses #2, 22, and 32.
when? 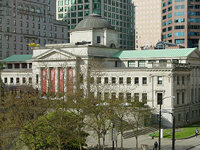 The Vancouver Art Gallery is open daily from 10:00 a.m. to 5:00 p.m. and until 9:00 p.m. on Tuesdays. The Vancouver Public Library is open from 10:00 a.m. to 9:00 p.m. on weekdays, 10:00 a.m. to 6:00 p.m. on Friday and Saturday, and noon to 5:00 p.m. on Sunday. The Museum of Vancouver is closed on Monday, open other days from 10:00 a.m. to 5:00 p.m. and to 8:00 p.m. on Thursday. £$€¥ Admission to the Vancouver Art Gallery: Adults: $20; Seniors and Students: $15; Children $6; Family: $50; and by donation on Tuesday after 5:00 p.m. 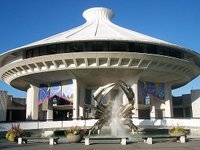 Admission to the Museum of Vancouver: Adults: $12; Students and Seniors: $10; Youth: $8; and Family: $35. Admission to the Public Library is free. BC Place, Rogers Arena, and Telus Science World are located close to each other in the district called Yaletown. 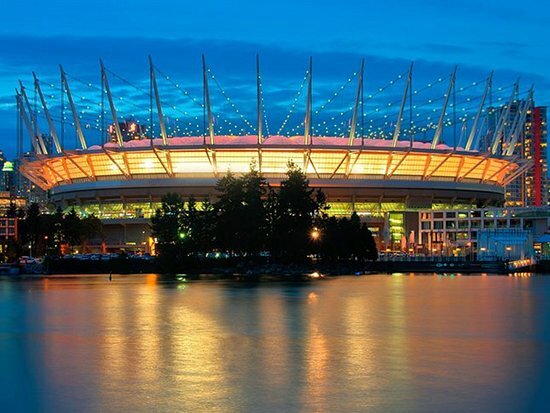 BC Place Stadium is home to the BC Lions Canadian football team as well as the Vancouver Whitecaps Soccer team. It served as the Olympic Stadium for the 2010 Winter Games and is a spectacular sight with the world’s largest cable-supported retractable roof, opened or shut depending on weather. Besides such sporting events, it is the site of concerts and trade shows, and houses the BC Sports Hall of Fame. Rogers Arena is where the Vancouver Canucks hockey team plays, while it also hosts skating shows, concerts, and other events. 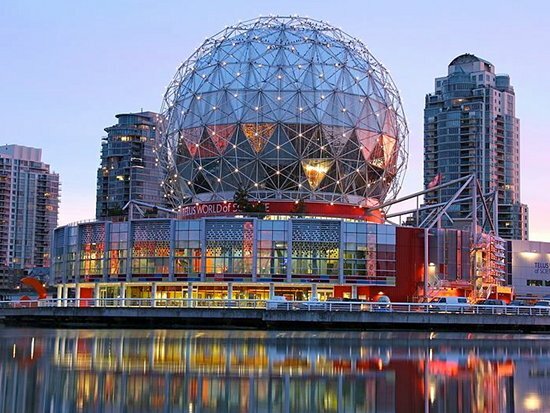 The geodesic shaped Science World is a modern, comprehensive science museum, featuring interactive exhibits involving water, light, and sound, live animals and insects, the human body, and environmental sustainability. where? All three structures are located at the eastern end of False Creek, and are served by the Stadium/Chinatown and Main St./Science World SkyTrain stations. They can also be accessed by foot or bike and by the False Creek Ferries and Aquabus. While they are accessible by car, public transportation is highly recommended. when? 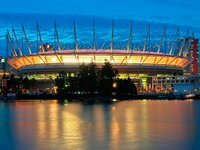 BC Place and Rogers Arena are open whenever games and other events are scheduled. 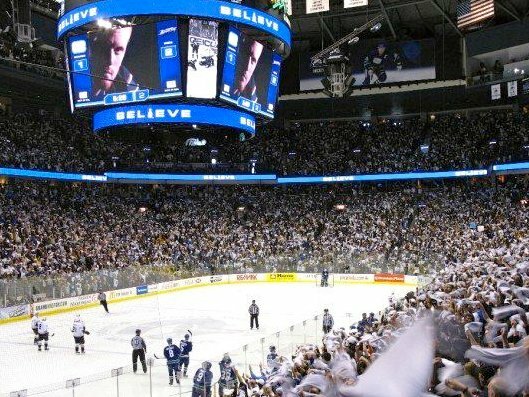 Rogers Arena also has daily tours, except when occupied by major events. Science World is open daily from 10:00 a.m. to 5:00 or 6:00 p.m. depending on the day and season. £$€¥ The price of football, soccer, hockey, and concert tickets varies. 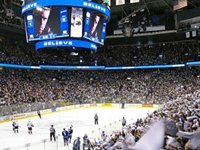 Admission to Rogers Arena tours: Adults $12; Students and Seniors: $8; Children: $6; and Family: $30. 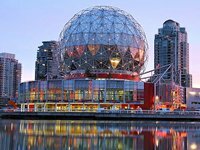 Admission to Science World: Adults: $25; Youth, Students, and Seniors: $21; Children: $17.75. Tickets can also be combined with entry to the OMNIMAX film theatre. The University of British Columbia is one of the largest and leading universities in the country. Two of its main attractions are its famous Museum of Anthropology and its Botanical Garden. The Museum is an architectural treasure in a spectacular natural setting; its focus is First Nations peoples of BC, of which it houses over half a million artifacts, including totem poles and sculptures. But it also contains 10,000 objects from around the world, especially Asia. The Botanical Garden is equally outstanding. Over 100 acres in area and containing 8,000 different plants, it is best combined with visits to the nearby Nitobe Memorial Garden, Greenheart Canopy Walkway (an aerial trail), and Beaty Biodiversity Museum. 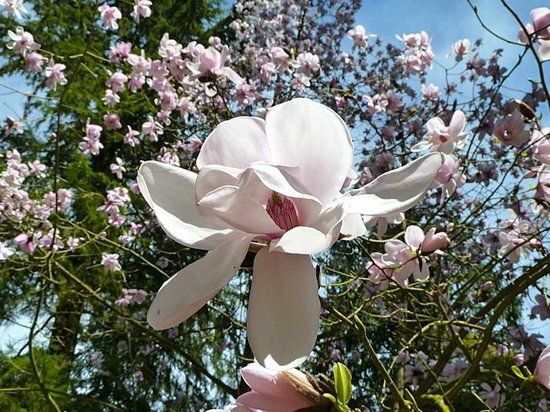 Given the mild and moist Vancouver climate, the city has many other gardens worth visiting, including the Dr. Sun Yat-Sen classical Chinese Garden in the heart of Chinatown, and the Vandusen Botanical Garden in the centre of the city. where? UBC is located on the picturesque western tip of the city. 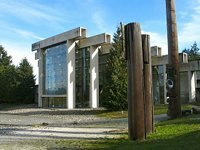 Both the Museum of Anthropology (6393 NW Marine Drive) and the Botanical Garden (6804 SW Marine Drive) can be accessed from the UBC bus loop, taking the #C20 Community Shuttle, or by car. when? The Museum of Anthropology is open daily from 10:00 a.m. to 5:00 p.m., and Tuesdays until 9:00 p.m. The Botanical Garden is open daily from 9:30 a.m. to 5:00 p.m.
£$€¥ Admission to the Museum of Anthropology: Adults: $16.75; Students and Seniors: $14.50; and Family $44.75. Admission to the Botanical Garden: Adults: $24; Students and Seniors: $18; Children: $12; and Family $50.00. A combined ticket to both attractions costs $33 for adults, $28 for students and seniors, and $85 for families. These two separate and exhilarating attractions are located close to each other north of the city. 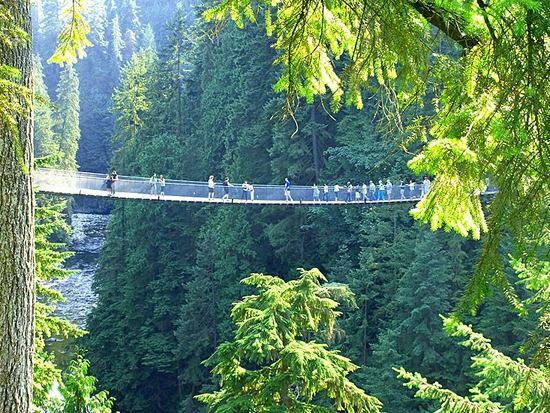 Capilano Suspension Bridge is a 140-metre bridge some 70 metres high that offers a safe but thrilling walk through the rainforest with a view of the canyon below. An even more exciting 210-metre Cliffwalk has recently been added, while 7 smaller suspension bridges enhance the experience. Grouse Mountain provides a spectacular panoramic view, focusing on its skyride, the largest aerial tramway system in North America, complimented by eco-walks, lumberjack shows, and ranger talks. where? To access the Capilano Suspension Bridge Park (3735 Capilano Road) by car, drive across Lions Gate Bridge to North Vancouver and follow Capilano Road. Public transit is provided by Bus #246 from Georgia Street or #236 from Lonsdale Quay. Grouse Mountain (6400 Nancy Greene Way) is further along Capilano Road. Each attraction has a free shuttle bus available in the summer from Canada Place in downtown Vancouver. when? Capilano Bridge Park is open daily except Christmas Day from 9:00 a.m. to 5:00 p.m. and in the Summer from 8:30 a.m. to 8:00 p.m. Grouse Mountain is open from 9:00 a.m. to 10:00 p.m. every day. 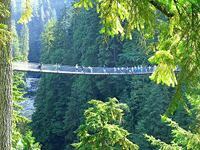 £$€¥ Admission to Capilano Suspension Bridge Park: Adult: $34.95; Senior: $32.95; Student: $28.95; Youth: $21.95; and Child: $12.00. The basic fee for Grouse Mountain is Adult: $39.95; Senior: $35.95; Youth: $23.95; $Child: 13.95; and Family $105.95. 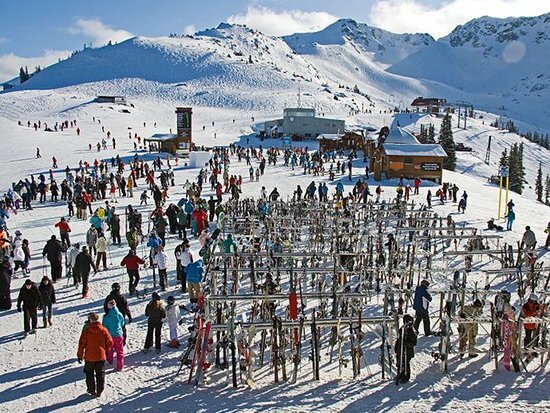 Whistler is one of the most famous ski resorts in Canada and hosted the skiing events of the 2010 Winter Games. Depending on the weather, skiing usually extends from November to May, and is supplemented by heli-skiing, backcountry day tours, the tube park, snowmobiling, snowshoeing, cross-country skiing, sleigh rides, and helicopter sightseeing. But based on its spectacular views, Whistler has much to offer in the summer as well. 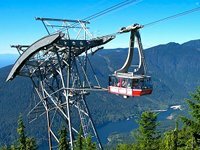 Attractions include the PEAK 2 PEAK Gondola between the top of Whistler and Blackcomb Mountains, the highest in the world, alpine walking trails, the Whistler Mountain Bike Park, ziplines, golfing, rafting, festivals, shopping, dining, and nightlife. where? 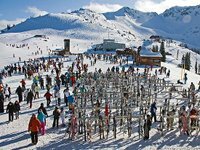 Whistler is located across the Lions Gate Bridge and then 125 km north on the spectacular Sea to Sky Highway #99. It is accessible by car, airport transfers, train, and bus. when? Winter or summer. The PEAK 2 PEAK Gondola operates in the summer from 10:30 a.m. to 4:45 p.m., on weekends in the fall, and again throughout skiing season. 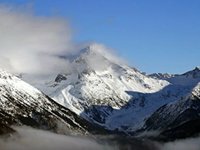 £$€¥ The price of ski packages and other winter activities varies, as does the price of summer activity packages. Rates for the PEAK 2 PEAK Gondola: Adults: $48.95; Seniors and Youth: $41.95; Children: $24.95. 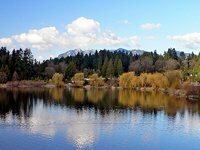 Vancouver is also in close proximity to the attractions of Vancouver Island and the Gulf Islands. 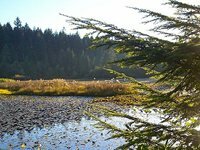 Vancouver Island is the home of the capital of British Columbia, Victoria, which has a wide array of attractions in its own right. 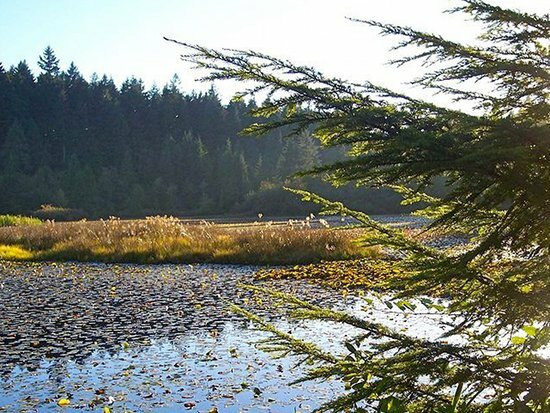 Other enticing locales on the Island, drawing on the rainforests with their gigantic old-growth trees, whale and bird watching, salmon and trout fishing, and hiking, include the beach resorts of Tofino and Ucluelet, Pacific Rim National Park, and the West Coast trail. 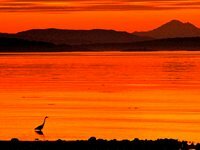 Between Vancouver and Vancouver Island are some of the most beautiful and tranquil islands in the country, namely the Gulf Islands, including Galiano, Salt Spring, Pender, Mayne, and Saturna. Besides their moderate climates which produce luxurious vegetation, and their scenic views of the sea, they are the location of much artistic activity and art and craft studios, prominently populated by painters, sculptors, poets, and writers. where? Vancouver Island is connected to Vancouver by air and by ferry, especially to Victoria and Nanaimo. The Gulf Islands are connected to Vancouver and Victoria and to each other by a series of smaller ferries. when? 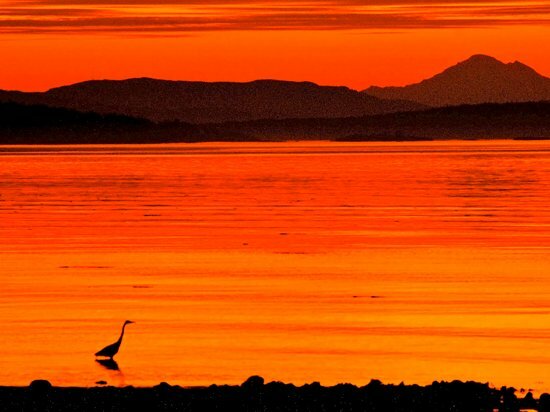 Vancouver Island and the Gulf Islands are accessible year round. They are especially beautiful in the summer, but their moderate climate makes them very popular in the otherwise cold Canadian winter. £$€¥ Air and ferry rates vary.